Frank Dobson says the delays are a "disgrace"
Plans to upgrade London's ageing St Bartholomew hospital are in doubt, with hospital chiefs saying doctors have only days to save refurbishment plans. The warning has come after a meeting sparked by the government's announcement it was reviewing the £1bn refurbishment plans. 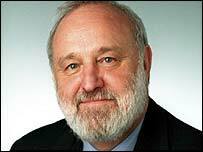 Former health secretary Frank Dobson told BBC London it would be "a disgrace and a betrayal" if Barts was to close. 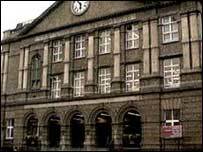 Both Barts and the Royal London would have been refurbished under the plans. But the plan - which has already been delayed twice - has been halted by the Department of Health (DoH) and the Treasury. Doctors fear the hospital could be forced to close and say that would badly effect health services in the East End. Mr Dobson said that in 1997 he had set up a review with the help of Sir Leslie Turnberg. "Together with other experts he consulted people from all over London, and came up with the a thoroughgoing review and proposals affecting all of London. "Part of that was to save Barts, we accepted, the government accepted, the prime minister accepted every part of that including the saving of Barts. "There is no excuse for the government to go back on that now." He said it had taken far too long for the government to come up with new proposals, and that the dilapidated buildings were "a disgrace". Under the scheme the Royal London would have been the UK's biggest new hospital and Barts would have become home to state-of-the-art cancer and cardiac centres of excellence. A statement from the DoH had said: "We have asked the trust to re-consider its plans to ensure that the Barts and Royal London scheme is both affordable and meets local needs. "The trust has been asked to consider further the inclusion of the Barts element within the scheme as part of this process." But a statement from the Barts and The London NHS Trust said the two hospitals facilities desperately needed to be replaced and that the project was affordable. It said: "The long-anticipated and much-needed redevelopment of both hospitals will deliver world-class medical facilities for the people of East London and beyond, including 300,000 new Thames Gateway residents."